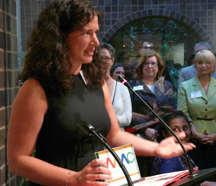 On June 17th, in the elegant setting of the Arthur M. Sackler Foundation, The Women’s Media Center held an awards event to honor ten women for their specific contributions to the field. 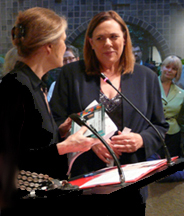 The evening, hosted by Elizabeth A. Sackler, was presided over by WMC co-founder Gloria Steinem and the organization’s president, Carol Jenkins. The space was packed with women active in old and new media, advocacy, and culture. Young women studying journalism were an integral part of the mix. Jenkins qualified the intergenerational component as “the highlight of the evening,” before stating that “a diverse universe of women in media” was a key goal of the WMC. The honorees included Christiane Amanpour, Helene Cooper, Candy Crowley, Bonnie Erbe, Tina Fey, Rachel Maddow, Lynn Nottage, Gina Reticker and Abigail Disney, Pam Spaulding, and Rebecca Traister. Six of the women were able to be on hand to receive their awards. 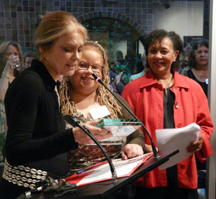 Gini Reticker, the director of Pray the Devil Back to Hell, was appreciative of the honor because “The Women’s Media Center stands for telling under-reported stories.” The film portrays the struggle of Liberian women to end the violence in their country through demonstrations and perseverance. Christian and Muslim women linked forces to create a resolution to the nation’s civil war. “It was a story that was going to be completely overlooked and disappear. It was women who changed the country,” Reticker said. Editor-in-Chief of Salon.com, Joan Walsh, believes “things are much better than they’ve ever been.” On the role of new media as a catalyst she said, “It’s a new landscape and women can make more inroads. It’s a big event that Rachel [Maddow] has her own show.” Walsh, however, did lament that women were still looked upon as “a diversity” and “not equal partners.” Throughout the night, Walsh received kudos from other guests on her toe-to-toe confrontation with Bill O’Reilly, where she had pointed to his role in dialing up the incendiary rhetoric on Dr. George Tiller. Lynn Nottage, Yale School of Drama graduate and a recipient of a Guggenheim fellowship, MacArthur “Genius” Award, and this year’s Pulitzer Prize for her play Ruined, spoke about her visit to the Democratic Republic of the Congo in 2004. She went to Africa to get on-the-ground narratives from women whose lives had been impacted by the violence and conflict. She described the experience as “transformative.” What she learned served as the underpinnings of her drama. as moderators of the final Presidential debates. •	Media Executives: For failing to create a diverse White House press corps. When she was there ten years ago, as a new mother who was feeling “blocked,” she opened a book that contained the names of women who had previously occupied her cabin. One of those people was Gloria Steinem. After the list, someone had written a version of the 1969 Judy Grahn poem, “The Common Women.” It gave her the strength to write.